Here is tonight's stitching. 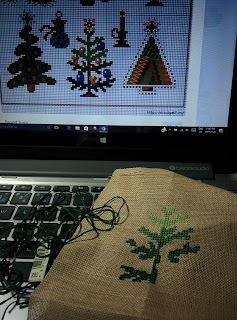 I am stitching the tree in the middle with the bulbs from my dear friend pinterest. I had been feeling all wonky today at work and that feeling continued into this evening. My system is probably trying to ward off a virus or something, making my bones feel achy and a mild exhaustion making it difficult for me to get out of my own way. The brain fog resulted in a few curses and some ripping out of stitches when things did not meet up properly. Well, the dog is staring at me from across the coffee and I am not eating anything so she must need to be let out. Happy stitching!